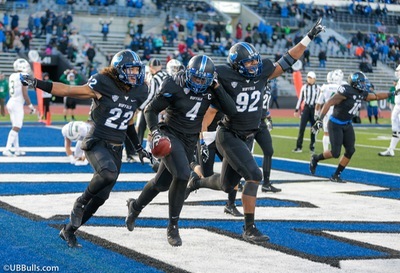 Each week, Bob Gaughan recaps the college football weekend with everything you need to know about UB, the quarterback prospects and the College Football Playoff. The UB Bulls started off fast and led Ohio 24-7 after the first quarter. Ohio fought back and tied the score at 24 going into the fourth quarter. Emmanuel Reed ran over from one yard out in the fourth to give the Bulls a seven-point lead 31-24. Khalil Hodge intercepted a pass in the endzone to seal the victory for the Bulls. The stars of the game again were the combination of Tyree Jackson and Anthony Johnson. Jackson threw for 294 yards and two touchdowns. Both TD’s went to Johnson who had 155 yards receiving. Johnson broke the Bulls single season receiving TD record. He now has 14 TD’s on the season. Earlier in the week Johnson stated he plans to return to UB next year and not go into the NFL draft. There are 78 bowl spots. Currently 79 teams have 6 wins. There are three teams still able to get 6 wins (Florida State, New Mexico State and Louisiana Lafayette). This means there’s no guarantee the Bulls will go to a bowl. For Bulls fans hopefully the offensive firepower of Tyree Jackson and Anthony Johnson make them an attractive pick to a bowl. Jarrett Stidham led the Auburn Tigers to a 26-14 victory over Alabama. The loss was the Tide’s first of the season. Stidham passed for 237 yards and ran for a fourth quarter touchdown. Alabama made a few uncharacteristic mistakes that hurt them. A botched field goal and two straight botched snaps in the fourth quarter were symbolic of the Tides day. The Tide will appear to slip out of the first four this week and will have to wait and see next week if they will be in the title picture. I expect Clemson, Oklahoma, Auburn and Wisconsin to be the final four this week. Alabama slips to five. The Hurricanes perfect season came to an end in an unlikely place on Friday. Pitt was 4-7 coming into the game but handed the “U” a 24-14 defeat. The Hurricanes were sluggish throughout the game. QB Malik Rosier was just 15 of 34 for 187 yards and two touchdowns. He was actually benched for a series in the second half. The Hurricanes still play Clemson next week in the ACC title game. The Buckeyes still have hopes to be in the final four. Ohio State needed a back-up QB to take down rival Michigan 31-20. Michigan jumped out to a 14-0 lead. Dwayne Haskins replaced injured JT Barrett in the third quarter and led the Buckeyes to the win. Michigan has now lost 13 of the last 14 games to the Buckeyes. Jim Harbaugh is now 0-3 against Ohio State and 1-2 vs Michigan State. The Buckeyes play Wisconsin next week in the Big 10 title game. The Sooners averaged 12 yards per play vs West Virginia in a 59-31 romp. Baker Mayfield passed for 281 yards and three touchdowns. Mayfield still looks like the favorite to win the Heisman trophy. Oklahoma will play TCU in the Big 12 title game next week. Clemson will remain in the top four with their 34-10 win over inter-state rival South Carolina. The Clemson defense dominated the day. The Gamecocks had only 207 yards of offense on the day. Clemson play Miami next week in the ACC championship. Wisconsin dominated Minnesota 31-0. The Badgers held the Gophers to only 133 yards of offense. This is the Badgers first undefeated regular season since 1912. Alex Harnibrook threw three TD’s for the Badgers. Wisconsin plays Ohio State next week for the Big 10 title. The game of the weekend was UCF’s 49-42 win over USF on Friday. Just two years ago UCF was winless. They are the first team ever to go from winless to undefeated in two years. Scott Frost is sure to be on the top of many coaches’ searches this year. The game had 1,186 yards of offense. Quentin Flowers had 605 yards off offense in a losing cause for south Florida. The winning points came from Mike Hughes who returned a kick-off 95 yards with 1:28 to play to break the 42 all tie. *Lamar Jackson got into a fight and beat Kentucky with 372 yards of offense. Louisville takes it to Kentucky 44-17. *Stanford blew out Notre Dame 38-20 and will play USC in the Pac-12 Title game vs USC. The Pac-12 will be left out of the final four this year. *Chip Kelly agreed to a five-year deal to be the next Head Coach at UCLA. Other coaches fired: Bret Bielema at Arkansas and Mike Riley at Nebraska. Arizona State coach Todd Graham said he believes he will be fired. Tennessee and Florida already let go their coaches. Some big programs will have new coaches next year.